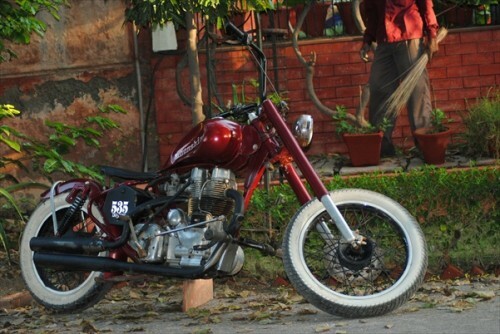 A custom Royal Enfield chopper for sale in India sports dual exhausts. These sprout from what the seller describes as a "stock" Royal Enfield Lightning 535cc engine. It's a cool looking motorcycle and the twin mufflers must cause some double takes from those who see it. 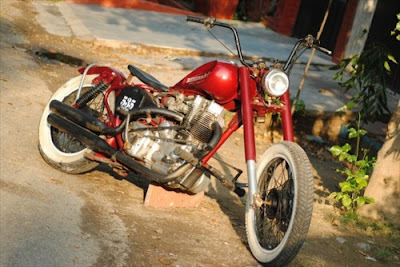 But I presume the top muffler, which appears to reach the motor just under the carburetor, has no actual function. "What's it for?" is probably a dumb question when asked about a custom chopper. It's there because the owner likes it and no further explanation is necessary. But it is fun to speculate about possible uses it might serve. I once suggested that Royal Enfields should mount a small solid fuel rocket booster in this position, for one-time use in any impromptu drag race. That's probably not very practical. So what could be made of this silent silencer? How about a custom luggage compartment for your pool cue or fishing rod? Any other suggestions? Make a comment here. The motorcycle is for sale in Noida, Uttar Pradesh. 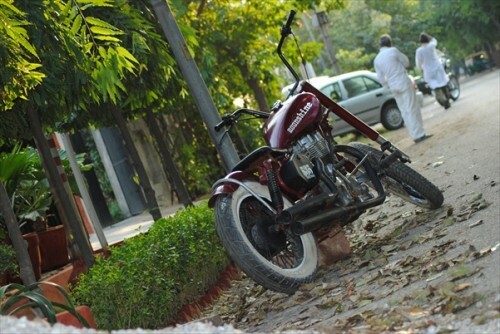 Asking price is 69,000 rupees, about $1,600, according to one on-line converter. I'm diggin the dished Frisco style tank and wide whitewalls...nice! Apologies but this bike does ZERO for me. Why pretend that it's a twin when it's not? What's to be gained by such foolishness? 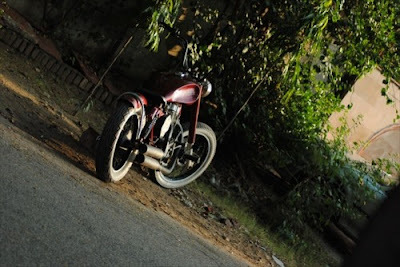 apologie'z accepted :P, Shannon@ cant agree with you more..the byk does give an old skool feel to it..As for the makeshift twin exhaust..it sure luks gr8..specially after screeing alot many custom RE's sporting double exhausts..
hello, i am interested in getting one of these could any one contact me regarding this bike. as i stay at mahipalpur. i am seriously interested about this bike. Please contact me at-8130468671.